It’s an ego boost to sit in the power chair and see heads turn in your direction. You enjoy it. You come to expect it. The beginning of the leadership journey is about getting heads turning in your direction. 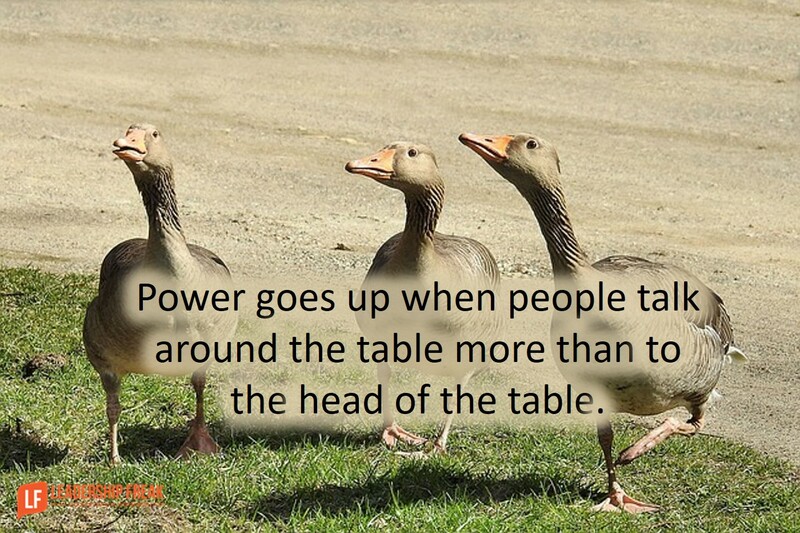 As time passes, you see that leadership is about turning heads toward each other. Declare your intention to develop a team where heads turn toward each other. Say, “I want us to develop options and select solutions as a team.” Explain why it matters. Provide opportunity for people to talk with each other by slowing down your quick brain. Take a breath before speaking. Practice strategic absence. Make space for others to interact with each other by temporarily leaving a meeting. What would it take for you to feel comfortable leaving a meeting? Aim for balanced participation during team conversations. What behaviors best encourage people to talk with each other during meetings? When our team is at it’s best, how are we interacting? How might we do more of that? What comes to mind when you think of improving the way we interact? Give public acknowledgement when you see behaviors that cause heads to turn toward each other. What leadership behaviors encourage people to talk with each other? What I have found tricky in meetings is driving this forward while ensuring there is only one conversation going on at a time! What a timely post! Instead of leading the meeting from the front of the room I’m going to turn all the tables/chairs so that we’re in circle. The discussions here seem to revolve around “ideal” meetings. We tend to forget that very few meetings are held to discuss new or even old ideas. Some meetings are held to discuss how a contractor or a consulting is NOT doing a job properly. In other words, these meetings are actually held to be a critique of a consultant’s or contractor’s job. Do the words “service requests” and “change orders” come to mind? One thing I took away from this is the idea of asking questions that engage everyone. From a leaders perspective and from a team member’s there has to be a quieting of the quick thinking and an opportunity given to have everyone be engaged. I mean the whole point of having everyone at a meeting is that it will most likely impact everyone and they need to know their opinion is valued and encouraged. How would you find that balance if a you have a team member that won’t let others contribute by always providing input? Would you just acknowledge it and ask a question of someone else? Nice article .. the secret sauce is dosage of humility .. will make a leader who people /team will aspire to be ..
Great post. I think these are some of the things that even great leaders sometimes still miss. This is one great blog to remind leaders and those who want to be one.